Protests have taken place around the world against the ongoing demolitions and forced removals at Larung Gar Buddhist Academy. In London, around 100 people took part in a four-hour demonstration outside the Chinese embassy that was organised by Free Tibet, Students for a Free Tibet, Tibet Society and Tibetan Community UK. During the demonstration, Tibetans, Tibet campaigners and members of the public stood opposite the embassy and chanted slogans while waving Tibetan flags and placards showing the damage already caused to Larung Gar. Members of the four organising groups made speeches and conducted interviews with several journalists that had come to report the demonstration. As night approached, a one-minute’s silence was observed for the three nuns that have reportedly committed suicide in response to the demolitions. Candles were lit and many of the Tibetans present conducted prayers, followed by a rendition of the Tibetan national anthem. Other protests took place around the world on 19 October in cities including Buenos Aires, Delhi, New York, Paris, Santiago, Taipei, Tokyo, Toronto, Vancouver and Washington DC. Meanwhile in the USA, representatives James P McGovern and Joseph R Pitts, the Co-Chairs of the United State Congress' Tom Lantos Human Rights Commission, have written to the Chinese Ambassador to the United States. 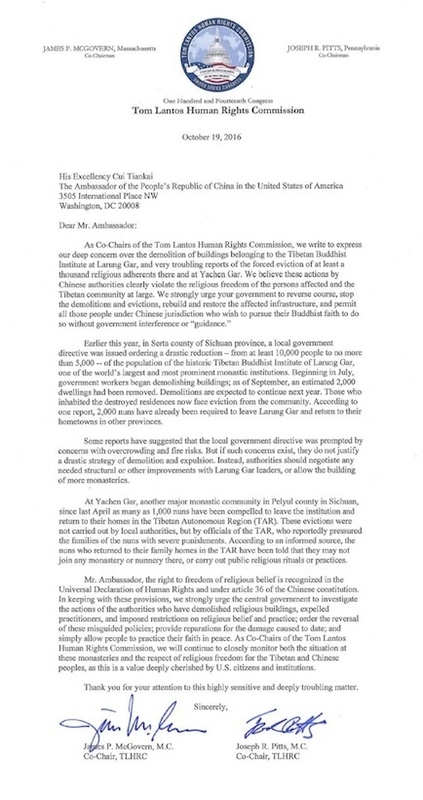 In the letter, sent on 19 October, the representatives express their "deep concern" over the removals and demolitions at Larung Gar. The letter also raises the case of Yarchen Gar, a monastic community in eastern Tibet, where as many as 1,000 nuns may have been compelled to leave under pressure from the Chinese authorities. Global pressure on China is mounting. Add your voice and call on China to halt further removals and demolitions. You can also urge your government to speak out.